Trunks: Shrubs, rarely trees, erect, forming thickets from root-suckers; bark grayish brown, initially smooth, eventually fissured, somewhat flaky; wood white, hard. Twigs: Greenish brown to reddish brown, flexible, smooth or slightly furrowed, glabrous; leaf scars half-round; buds reddish brown, ovoid, .1 to .14 inch, apex obtuse, scales ciliate. Leaves: Deciduous, opposite, 3-foliolate, 2 to 10 inches; stipules falling early, linear, .4 to .6 inch; petiole 1 to 4 inches, glabrate or sparsely pubescent to velvety; leaflets elliptic to ovate or obovate, 1.6 to 3.6 inches long, .4 to 2 inches wide, base obtuse to truncate, margins minutely toothed, apex acuminate to cuspidate, abaxial surface pale green, sparsely to densely velvety, adaxial surface green, glabrate to sparsely velvety; terminal petiolule .4 to 1.4 inch, much longer than laterals. Flowers: Panicles, drooping, (2-)5-20-flowered, 2 to 2.4 inches; pedicels jointed, .24 to .45 inch, glabrous or sparsely velvety. Flowers bisexual, radially symmetric; sepals 5, distinct, oblong-ovate to oblong-triangular, .24 to .3 inch, glabrous, apex obtuse to acute, calyx campanulate; petals 5, white, erect, spatulate, .3 to .4 inch; stamens 5, inserted at margin of a disk, alternate with petals; pistil 1; styles 3, .16 to .2 inch, glabrous. Fruit: May and July; capsules in drooping clusters, yellowish green, papery-inflated, ellipsoid to ovoid or obovoid, 1.2 to 2 inches long, 1.2 to 1.6 inch wide, sparsely pubescent distally; seeds light brown to brown, ellipsoid to globose, ca. .25 inch, smooth, glossy. 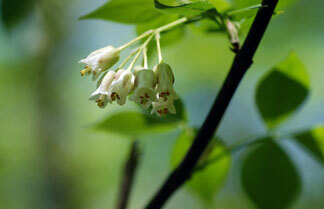 Habitat: Moist woods, along streams, thickets, or rocky, wooded hillsides; calcareous soils. Uses: Native Americans steeped the powered bark and used the liquid as a wash for face sores and a wash to stop babies crying. A compound infusion made with the plant was used to treat rheumatism. The seeds were considered sacred and were used in rattles for medicine dances. Comments: American bladdernut is a common understory shrub of moist forests and woodlands in eastern Kansas. It is easily identified by its white flowers and inflated, 3-pointed fruits. Forms thickets. Fruit can remain on plant until winter. From Greek staphyle "bunch of grapes" alluding to the flower clusters.